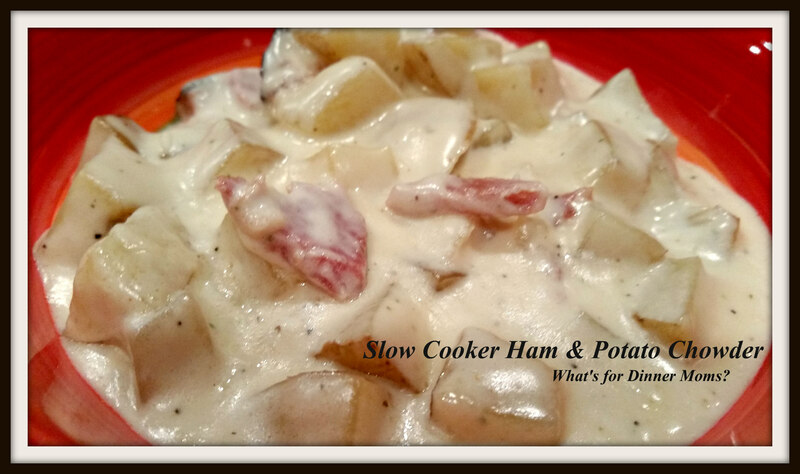 Slow Cooker Potato and Ham Chowder – What's for Dinner Moms? So, we had Ham the other night with our Sweet Potato and White Potato Gratin (click for link to recipe). I had plenty of leftovers as ham was on sale before Christmas and I made sure to pick up a 15 lb. spiral cut one on sale. When I make my menus I try to plan nights were I will cook extra meat that will then be made into two or three new dishes for dinners. I may freeze part of the meat, as I did with the ham, and use part or just plan two or three meals from it all at once. With the cold weather continuing for the foreseeable future a nice crock of slow cooker soup cooking when we get home is perfect. This takes an extra step or two in making but to make it without “cream of something” soups is what I prefer. It is far easier to open a can and add it to the chowder but next time you walk by your pantry pick up a can and read the ingredient list. I added butter, flour and whipping cream (you can also use fat-free half and half but I only had whipping cream on hand). Ingredients you know and understand. I cannot pronounce some of the ingredients on a cream of soup can. I am trying to get away from using cheese in every dish but this chowder would also be delicious with a nice sharp cheddar cheese added to it. This was a hit! I served this with a nice crusty loaf of bread for dipping. Both kids ate two bowls and licked them clean! The flavor was perfect. The creamy soup made us all feel warm and toasty. We had plenty of leftovers for lunches the next day! Place potatoes, ham, stock and seasoning blend in the bowl of the slow cooker. Stir well. Cook on low for 5-6 hours until potatoes are cooked through. Melt butter in a saucepan. Sprinkle flour over top and stir well. Allow to cook for 1-2 minutes then add cream. Allow mixture to simmer, but NOT boil, for 3 -5 minutes. Mixture will thicken and coat the spoon as you lift it up. Pour the cream mixture over the potatoes and ham and stir well. Taste and adjust spices as needed. Cook an additional 1 hour over low heat stirring occasionally. Serve hot with bread for dipping if desired. Previous Post Sweet Potato and White Potato Gratin – Thank You ALL! Oh this looks so good! Now you have me ready to chow down. Yummmmmmmm! I love a slow cooker especially in winter, am taking note of this to cook for my mum and dad! Thank you!